Can this low-cost word processor muscle in on Word's turf? This is a great time for Mac software. The big guns – Apple, Microsoft, Adobe, and so on – are being regularly challenged by upstart developers offering low-cost, efficient products to replace bloated, expensive tools. 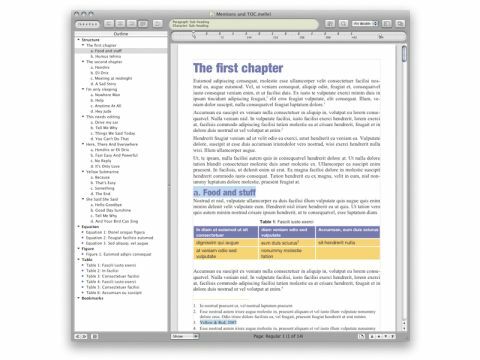 Redlex Mellel aims to take on Word, offering functionality on par with Microsoft's near-ubiquitous word processor, but at a fraction of the price. Upon first launching Mellel, you might be forgiven for thinking us crazy in considering it any kind of threat to Microsoft's dominance. The brushed-metal interface is like a mutant Mac application, borrowing design conventions from iTunes, BBEdit, Word and others. But Mellel comes across as dated, ugly and clunky. Sadly, the same is initially true when it comes to usability. This isn't an application you can rapidly get to grips with. When experimenting, you get tantalising glimpses of the power under the hood, but the interface is so idiosyncratic that frustration soon sets in, with cumbersome dialog boxes and palettes making the application borderline impenetrable. You fast become lost in the maze of options peppered throughout. Mellel's saving grace is its help systems. The built-in manual is clear, concise and helpful, and the online video tutorials provide insight into the application's most important functions. A couple of hours spent methodically working through examples reaps rewards, and opens up a world of possibilities – at least for specific kinds of authors. table-of-contents with a single click. Using the auto-titling function, you can easily structure and reorder elements within huge technical documents, and Mellel's performance is such that it never gets bogged down, even when documents run to many dozens of pages. Footers are a breeze to deal with, and headers can be dynamic, with content based on a relevant heading level from each page. The search and replace function rivals anything found in competing software. In general use, however, shortcomings become apparent. Most damning is Mellel's inability to undo past the most recent save point, which was enough for us to lop half a star off its score. This limitation is ludicrous and made us less inclined to save our work regularly. Also, translating documents between applications isn't perfect, and Mellel can't deal with Word's .docx files. Mellel is only really suited to authors working on technical documentation, academic writing, novels, or any projects that require accurate reference. As such, we suspect many simply won't bother with it. And so although it's something of a cop-out to recommend downloading and trialling the software yourself, it's the most sensible advice we can offer if this review has piqued your interest.